When an American anthropologist is kidnapped in Baghdad by seemingly ruthless fundamentalists, an exchange of ideas with his captors evolves into a spiritual quest for the meaning of faith. The Whitefire Theatre presents the world premiere of Infidel by Christopher Vened. The playwright directs for a Sept. 1 opening at the Whitefire Theatre, where performances will continue though Oct. 7. A suspense thriller that explores religious superstition and terrorism in the name of Islam versus unscrupulous Western imperialism and war mongering, Infidel stars Ted Monte (Circus Kane, The Young and the Restless) as John Norton, a specialist in early literature and writing whose purchase of an ancient Sumerian clay tablet from the Baghdad Museum is interrupted by the appearance of Islamic extremists. Amir (Bobak Cyrus Bakhtiari, Homeland, Madam Secretary, SF Bay Area Theatre Critics Circle nom for West Coast premiere of Betrayed) and Jamil (Ronak Gandhi, star of Los Angeles Asian Pacific Film Festival entry Best Buds) suspect that Norton is an American spy, working for the CIA. They take him to a remote mountain cave, where, along with Zakir (Michel Wakim of Mobster), Kasim (Nima Jafari, seen in Romeo and Juliet at Theatricum Botanicum and Nosferatu at Crown City Theatre) and Jamil’s young wife, Myiesha (Maral Milani, a recent graduate of UCLA’s School of Theater, Film and Television Every day we hear about terrorists who kill in the name of God, a concept that is impossible to grasp because most of us see it as a deed of pure evil,” says Vened. “Maybe it’s a fantasy, but I wanted to write a play that would humanize these radicals and find a way to liberate themfrom their fanaticism. I saw a video in which masked terrorists were destroying ancient sculptures with huge hammers on the religious grounds that those artifacts were blasphemous idols. It made me wonder about the incongruity between religion and culture that leads to conflict. When did culture and religion separate?” The creative team for Infidel includes projections and mask designer Sean T. Cawelti, sound designer Jeff Gardner, lighting designer Derrick McDaniel, costume designer Phoebe Longhi, props designer/set dresser Tiffany Miller, graphics designer Leonard Konopelski and casting director Raul Clayton Staggs. Rebecca Robertson-Szwaja produces in association with Bryan Rasmussen and the Whitefire Theatre. immigrated to the United States. He has rebuilt his career here, teaching acting and movement classes, directing theater and writing. He is the author of the acting book “In Character: An Actor’s Workbook for Character Development,” which is published by Heinemann Drama and has been in print since 2000. Part I of this book, “Identity,” inspired him to create Human Identity, a solo performance piece combining words and mime that premiered at the Lounge Theatre in 2014. 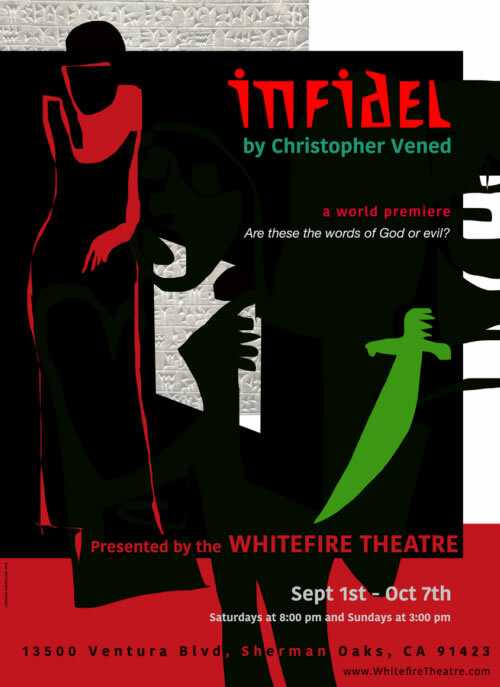 Infidel has been opened on Saturday, Sept. 1 and continues through Oct. 7, with performances on Saturdays at 8 p.m. and Sundays at 3 p.m. General admission is $35; full-time students with ID pay only $20. The Whitefire Theatre is located at 13500 Ventura Blvd. in Sherman Oaks, CA 91423. For reservations and information, call (323) 960-7738 or go to www.WhitefireTheatre.com.